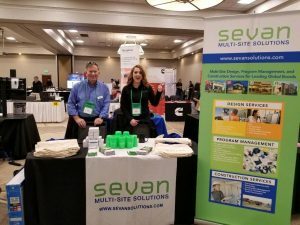 Sevan Multi-Site Solutions visited four college campus career and internship fairs to recruit top talent. The universities included Colorado State University, Texas A&M University, University of Cincinnati and University of Illinois at Chicago. These career and internship events are where Sevan recruits for summer and fall internship and co-op positions. 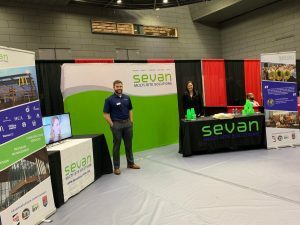 Sevan is hoping to get the company’s name and presence out at more campuses through career fairs, information sessions and events like resume reviews. This way, Sevan’s outreach and recruitment will continue to grow and bring in top students to help the company expand and succeed. “The more you do, the more you get your name out there,” said People Solutions Coordinator Morgan Ehemann. The first school Sevan visited was Texas A&M University on February 14 and 15. The Construction Science Career Fair was open to Construction Industry Advisory Council (CIAC) members only. Since Jim Evans, President and CEO of Sevan Multi-Site Solutions, is a member of CIAC, Sevan got the opportunity to meet with these ambitious students and grow its presence on campus. fair for information and introductions and a third day for interviews. The Sevan team at this event included Ehemann, Talent Scout Sarah Gonzalez, Assistant Project Manager Chris Groh and Chief Operations Officer Steve Kuhn. A unique experience from this event was visiting with a student who did his first co-op with Sevan during his freshman year in 2015. His positive experience with the Sevan team led him to seek out the company and will be finishing his college career doing another co-op with Sevan to round out his senior year. Sevan’s presence on campus has grown a lot in the past several years. Bill Homrighausen all represented Sevan. 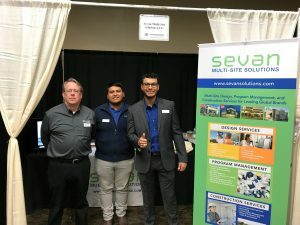 Both Compean and Andrade were found at Texas A&M career fairs and were happy to return to the campus as alumni to promote their experience with Sevan. This is the fourth career fair Sevan has attended at Texas A&M and the number of students has more than doubled from the last fair. Third, Sevan visited the University of Illinois at Chicago career fair on February 19. Ehemann was joined by Senior Project Manager of Design Jose Nieto, Project Manager of Design Carlos Santiago and Talent Coordinator Kelley Van Vleet. This was the first time Sevan visited UIC and attended the school’s Part-Time and Internships Fair. Sevan has been trying to have a presence at more local schools and UIC was a good place to find a pool of students to possibly work at the Downers Grove office, like with the design team which needs team members to be on-site. Lastly, Sevan visited Colorado State University on February 21. 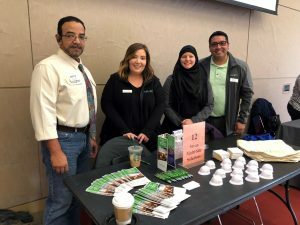 Project Engineer Kayla Bruegger, Talent Scout Kara Conliss, Senior Project Manager Clyde Dean and People Relations Coordinator Brandon Valdez attended the fair. Conliss attended school at Colorado State and helped the Sevan team get acclimated with the campus and reach students. Sevan finds the most success in connecting with students by bringing people who attended the university. Ehemann explained that most of the positions that need to be filled are co-ops and internships for the project management, design and survey teams. She said that a lot of students begin with the survey team where they can learn how projects start and understand the bigger picture. To learn more about Sevan’s internship and co-op program, visit our Internship page.